Nottingham's Dawn Trader began their career during the phenomenon known as the NWOBHM ("New Wave Of British Heavy Metal") that burst across the music scene in the late 70's and early 80's. Dawn Trader were not only one of the finest examples of this genre but were very definitely Nottingham's best loved band and (rather unfortunately) best kept secret. A loyal following of fans who travelled everywhere to see "their" band, fantastic musicians, great songs and an unrivalled stage presence Trader supported (and frequently blew away) many bigger acts like Def Leppard, Krokus, Raven and Magnum. 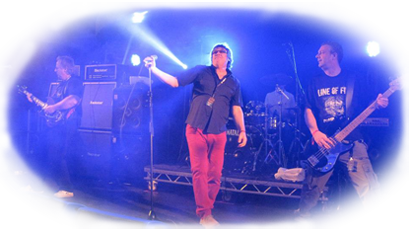 Formed by writer and guitarist Chris Allard in late 1979 from the ashes of local band Screw, championed along the way by such luminaries as Bernie Marsden from Whitesnake and Radio Trent DJ Graham Neale, the band had a number of incarnations and line ups during their six or seven year career. Allard left the band shortly after the release of their only official release (a piece of highly collectible vinyl that changes hands today among collectors and a new wave of NWOBHM fans for hundreds of pounds). Ever present members guitarist Wayne Vizard and bassist Ric Evans were subsequently blessed with a succession of amazing musicians and song writers like Steve Humphries, the incredibly gifted guitarist Andy Kealey, drummers Keith White and Don Bailey and all topped off by charismatic front man and top drawer vocalist Mick Preston. And so, despite Trader's untimely demise in 1986 after one last line up featuring Mick Preston's replacement Max Coxhead and with a distinct lack of commercial releases the band, their music (over 70 songs, we've discovered!!!) and those good time gigs have rested in the collective conscious and unconscious of Nottingham rock fans for over 30 years. Songs like "Roller", "Angel", "Whiskey & Coke" and "Castle" simply refused to die, and so In late 2009 the band and their fans reunited to celebrate the 30th anniversary of 'Nottingham's favourite band'. 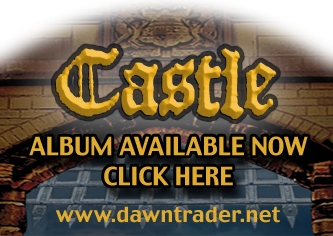 Still sounding and feeling fresh, exciting and powerful the band finally recorded what was possibly the longest-awaited debut album in history and "Castle" was released in 2011 to critical acclaim. The band have been gigging since, supporting the likes of Saxon, Y&T and the mighty Status Quo and with a few line up changes they are out and fighting again ! So, whether you have only ever heard of Dawn Trader through the archives and NWOBHM history books or if you are old enough to remember Trader and those heady days at the Hearty, The Greg, the Golden Diamond, the Palais, Rock City and even Blidworth Bottoms (! ), get your drinking (thinking!!) heads on and get ready for the voyage of the new Dawn Trader!!! "TURN DOWN" From the album " CASTLE"